A landslide is the general term that describes the movement of rock, soil and other debris down a slope as a result of gravitational pull. Landslides are most likely to occur in mountainous regions but may occur on any slope. There are many factors that can contribute to the likelihood of a landslide, including geological causes such as weak or sensitive materials, morphological causes such as tectonic plate shifting or soil erosion, and human causes such as deforestation, water leakage, imposed vibrations or excavation. 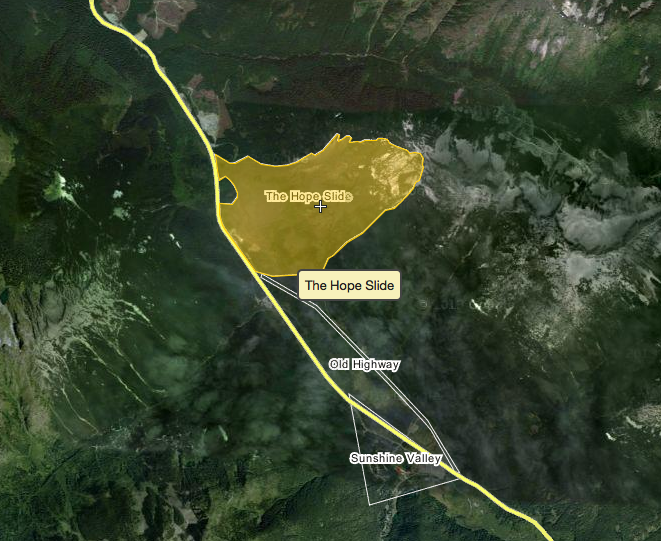 One of the most tragic landslides in Canadian history was the Hope Slide, which occurred at 7 a.m. on January 9, 1965, in the Nicolum Valley in the Cascade Mountains near Hope, British Columbia. 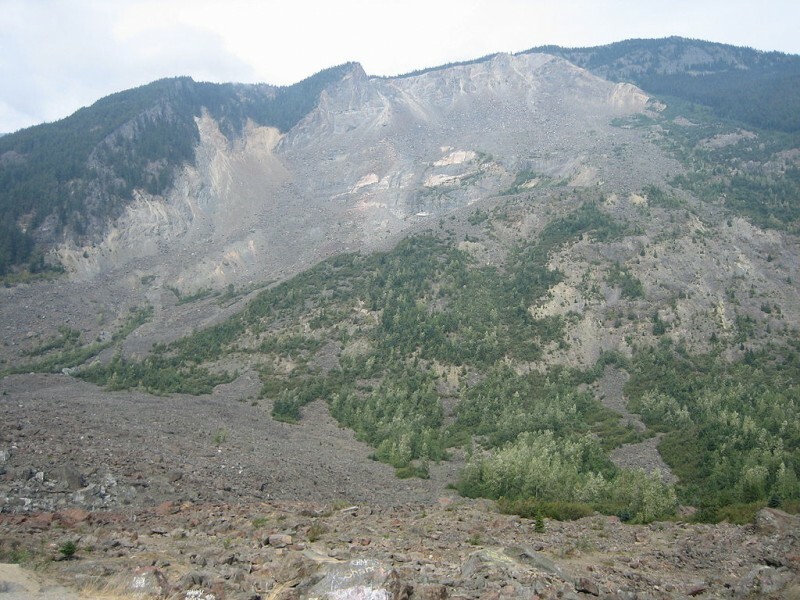 Shortly before the landslide, a small avalanche (different from a landslide in that an avalanche is made up of moving snow, not rock or sediment) occurred on a stretch of the Hope-Princeton Highway below Johnson Peak, approximately 150 kilometres from Vancouver, which forced four people to stop their vehicles. While they were waiting for the clearing crews, a second landslide occurred. The landslide buried the vehicles and the occupants, and all four people died under 47 million cubic metres of pulverized rock, mud and debris that fell down the 2,000-metre mountainside. This mass of debris completely displaced the water and mud in Outram Lake with incredible force, throwing it against the opposite side of the valley, wiping all vegetation and trees down to the bare rock, then splashing it back up the original (now bare) slope before settling. Recent research shows that these impacts against the opposite valley sides produced the seismic signatures interpreted as earthquakes. The landslide was caused by the presence of pre-existing tectonic structures (faults and shear zones) within the southwestern slope of Johnson Ridge. The lower parts of the slide scar are underlain by felsite sheets (which may have failed first) while the upper parts of the slide scar are underlain by highly jointed Paleozoic greenstone beds. Ongoing weathering and tectonic activity weakened the slide mass to the point where it had reached limiting equilibrium. Although we know the cause of the landslide, it remains unclear what the actual trigger was. A published analysis of seismograph records from January 9, 1965, suggested that the Hope Slide probably occurred as two rock avalanches separated by about 3 hours. Changes in groundwater condition are often a trigger for landslides, though are not thought to have played a role in the Hope Slide as the slide occurred during a protracted period of sub-zero temperatures in the winter. Weather records for the 25 days prior to the slide indicate that the temperature was much colder than normal, with the average daily temperature not exceeding 0º C, and on most days it was below -10º C (Earle, 2006). Some have suggested that freezing of seepage exit points may have caused an increase in water pressure at the toe of the slide. It is also suggested that progressive long-term deformation of the slopes of the southwest flanks of Johnson Peak caused the stability of the slope to deteriorate. We can conclude that the Hope Slide was the catastrophic result of very long term non-episodic mountain slope deformation. Since the landslide, the highway has been rerouted around and over the base of the slide’s debris field 55 metres above the original ground level on the other side of valley. As a result of the slide, the mountainside remains bare rock, without significant growth of trees or other large vegetation. Visitors to the region can view the scar of the landslide along Highway 3 at a viewpoint. Figure 8.10 Hope Slide; mountain scare is clearly visible from the side. Hope Slide (http://en.wikipedia.org/wiki/Hope_Slide) by Fawcett5 (http://en.wikipedia.org/wiki/User:Fawcett5) is in the Public Domain. Case Study 1: 1965 Hope Slide by Geography Open Textbook Collective is licensed under a Creative Commons Attribution 4.0 International License, except where otherwise noted.